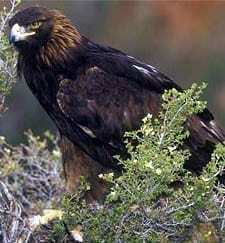 The Golden Eagle is one of the largest, fastest, nimblest raptors in North America. Lustrous gold feathers gleam on the back of its head and neck; a powerful beak and talons advertise its hunting prowess. You’re most likely to see this eagle in western North America, soaring on steady wings or diving in pursuit of the jackrabbits and other small mammals that are its main prey. Sometimes seen attacking large mammals, or fighting off coyotes or bears in defense of its prey and young, the Golden Eagle has long inspired both reverence and fear.